I've gone on a binge of watching YouTube videos of new writers unboxing the first copies of their debut book. The excitement, joy, and pride of making something amazing shows on their face. It's a special moment for budding authors, and it's addictive to watch. As soon as I got The End of Refuge formatted for paperback, I had to order a physical copy. I was excited to see my hard work finally in print. I knew there were practical reasons for ordering a proof copy before publishing, but what I wanted most was to physically hold my novel in my hands. After the novelty of having my novel in print wore off a little, I was able to really scrutinize the paperback and tweak all the little things which weren't quite working. I'll go through a lot of things that I needed to change and also other things to keep an eye on when proofing your own book. First, scrutinize the image of the cover. Does it look how you expected? Are all of the visual elements clear and harmonious? Can you see all the details? How about the color balance and brightness? One thing I noticed immediately was that my cover was that it was really dark. The image I used has lots of bright saturated colors which were muted too much when I added a black overlay. Next, look at the text. All the text on the cover should be legible. Proofread for spelling and grammar. Make sure none of the text is too close to the edges and correctly placed. I accidently used a different font on the spine and changed it to match the font used on the front cover. Finally, check the barcode. I'm using CreateSpace for the paperback copies of my book, and although they have a default placement for the barcode, they'll place it anywhere on the front or back cover it you specify a different spot. Make sure it's not hiding anything important or placed in the wrong spot. Next, check the interior formatting. Look at the headers and footers, page numbers and margins. Is everything where it's supposed to be or where you expected it? Look at the font size and line spacing. Is the text easy to read? How do all of the images and/or illustrations look? I had used the minimum recommended gutters, and the text was too close to the binding. Certain parts used a different font, and I had made it much too small. The margins were okay, but I had let Word handle widows and orphans, and the bottom margin varied wildly. One of the parts started lower on the page than the others. I also had a few scene break images which weren't centered properly. Finally, read through the whole thing. By this point, you've read your book so many times you're sick of it. Regardless, read it one more time. You may pick up more errors in a different format than reading on your computer screen. Even if you had a proofreader or editor comb through your manuscript, things might have slipped through or gone wonky during formatting. Some of my quotation marks were straight and some were curly. Same with the apostrophes. Also, check any other symbols: dashes, the copyright, special characters, etc. Only by reading through the entire text will you find all of these subtle errors. My proof needed a lot of work. All those little post-its sticking out were corrections I had to make. By the end, I ran out of post-its and just dog-eared the pages that needed attention. 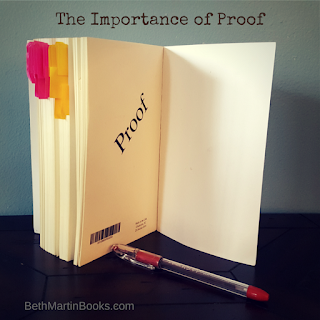 Don't dismay if your proof copy comes and you need to make lots of changes. It's worth the time and effort to put out the best book that you can.